What are the applicable smartphone models? Devices compatible with the “MOUTH BAND” “MOUTH NEWS” “MOUTH MONSTER” apps are detailed below. Devices compatible with the “MOUTH STATUS” app are detailed below. ※iPhone, iPad, iPad Plus, iPad Air and iPad mini are trademarks owned by Apple Inc. that are registered in the U.S. and other countries. The app froze and the screen turned white. Try deleting the app and restarting your smartphone. The app won't open or move. The app might not have been downloaded properly. Try uninstalling and reinstalling the app. Download Japanese Version of User Guide here. Download English Version of User Guide here. Download Chinese (Simplified) Version of User Guide here. How can I download the English or Chinese version of the apps? change the language setting of your smartphone or tablet to English or Chinese. Can G•U•M PLAY be used outside of Japan? This service is currently limited to Japan. G•U•M PLAY can only be used in the country of sales. What are the usable smartphone models? How do I check my smartphone model name and OS version? Where can I buy G·U·M PLAY? TSUTAYA ELECTRICS Online Shop, Tokyu Hands Toyosu Store. The apps can be downloaded for free on the App Store or Google Play. Is it possible for multiple users to share one device? Each user may simply download the apps onto his/her smartphone and create an account. The user data will be saved in each app. For kids without e-mail addresses, a parent may register for a family account with his/her e-mail address. All family members may share the same device and save each of their logs. Is it possible to use toothbrushes other than the G·U·M ones? Also, can this be used with kids' toothbrushes? Is it possible to use toothbrushes not on the "applicable toothbrushes" list? Other toothbrushes will not fit into the device. Even if the toothbrush can be attached, there might be difficulties with pressing on the device switch or keeping the toothbrush securely attached. Yes, the device is water-proof. How many days does the battery last? In the case of using the device three times a day and three minutes each, the battery lasts about 300 days. What types of batteries can be used? What is the suitable age for kids to use this device? With the guidance of adults, kids age 4 and above who can brush their teeth by themselves. To prevent kids from accidentally swallowing device parts. This product uses small components such as coin type batteries and sensor covers. Please pay attention to prevent young kids from putting the small components into their mouths. An alert to prevent users from brushing too hard. The intention is to encourage effective toothbrushing by brushing in a way that does not trigger the alert. How do I apply for repair when the device malfunctions? To receive free repair, please show your valid warranty. For areas not applicable for free repair, a fee is necessary even with a valid warranty. What is the purpose of development and concept of G·U·M PLAY? Toothbrushing is crucial for preventing periodontal disease. This development is an attempt to turn this everyday activity from something people "need" to do into something they "want" to do. Having fun while effectively brushing leads to healthy teeth and mouths, as well as bodies. This a proposal for a brand-new toothbrushing experience. How did the name G·U·M PLAY come about? The naming reflects our wish to make the daily activity of toothbrushing something that offers surprises and fun. How many colors do the device covers come in? Five colors: Pure white, mint green, astro gray, bloom pink, sky blue. About how much does the device weigh? 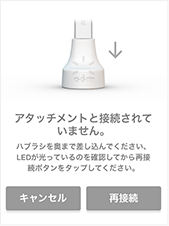 The device (including sensor unit, cover, and coin type battery; excluding toothbrush) weighs about 15g. What kind of data can Mouth Log collect? Duration and times of toothbrushing, and the locations that need more brushing out of the 16 areas inside the mouth. Toothbrushing is evaluated based on the "thoroughness of brushing" and "duration of brushing" of dental hygienists. How many months of accumulative data (chronological data) are displayed? Is it possible to change the months, weeks, and days into transitional graphs? It is possible to display data in any time period. At this stage, transitional graphs can be displayed by week,month, or year.After one year passes, the record will be renewed. If I log in to the same account, can I sync my toothbrushing log data on another device? Can I see the data I had saved on smartphone "A"on smartphone "B" as well? It is possible to see your "play data" on smartphone "B" if you use the same registered account. Check the steps for set up. I want to change the model of my smartphone/tablet. How do I transfer my current data? If you use the same registered account, your data will be transferred. monster collection data and calendar photos cannot be transferred. My provisional registration confirmation e-mail has not arrived. Make sure your e-mail address is correct, and check your spam mailbox. The device registration/change screen is not displaying the applicable device. Make sure your advice has been switched on. Insert your toothbrush into the device all the way to turn on the switch. Once the switch is on, recognition will appear on the registration screen. The app freezed, and the screen turned completed white. I cannot play even when I move my toothbrush (attached to the device). Check whether your device has been registered on the app. Edit your account on "Settings" in the menu: Tap on your account, change your device and try registering again. Check if the Bluetooth setting is on in your smartphone. Refer to your smartphone manual for information on Bluetooth usage. Make sure whether the LED is flashing. If the LED is not flashing, check if the coin type battery has been inserted correctly (with the plus side facing up). If the LED still does not flash, change the coin type battery. How can turn on/off the switch on the device? Push the toothbrush attached to the device all the way in to turn on the switch. The LED flashing twice means the switch is on. During use, inactivity will automatically turn the switch off. Not pushing in the toothbrush all the way into the device will make it difficult to press the switch and might cause detachment. If kids brush too much as they have fun defeating Mouth Monsters, will they hurt their teeth/mouths? Will defeating Mouth Monsters lead to the most effective way to brushing? An alert will appear on the screen if kids are brushing too hard. Do I need to register an account for each app? After registering on one of the apps, it is unnecessary to register again for the other apps. Simply log in with the same account. What is the remaining battery level for on the menu screen? It is the remaining battery of the coin type battery (CR2032) in the sensor unit of the device. How do I share my "play data" on social media? Mouth Log does not have a share function. To share Mouthe Monster, tap on the "share" button.